Our company is professional manufacturer of electric arc furnace, medium- frequency furnace steelmaking, secondary refining and continuous casting. 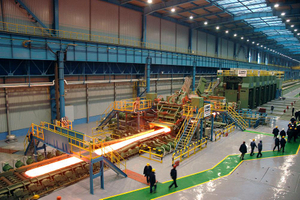 We are also manufacturer of steel rolling production line including designing, manufacturing, installation, debugging and trial production. Meantime, our company can also undertake engineering consultation, engineering designing and engineer project contracting (Turnkey project). Our company can manufacture the electric arc furnaces (capacity: 0.5t-100t) which are matched for steel making - continuous casting - rolling mill. The capacity of medium-frequency furnace is 2~30t. And our refining furnaces are including FL, VOD, AOD, VD. Furthermore, kinds of submerged arc furnace are also in the scope of our supply. Continuous casting machine is the main product of our company. Over the years, we have accumulated advanced production technology and experience in caster of square billet, round billet, rectangular billet, shaped section and steel slab.